The body adornments of East African pastoralists, though eye-catching, have been little studied and there has been no comprehensive description on the body adornments of specific ethnic groups. 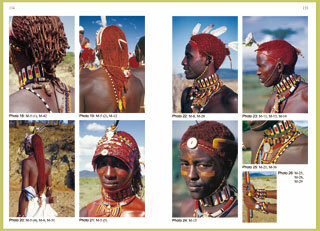 This book is a monograph that provides a complete picture of the body adornments of the Samburu in Kenya based on field research conducted by the author from 1999 to 2003. By measuring and describing every adornment worn by each of 249 Samburu people at the time of the survey, the author collected data on 6,323 adornments. 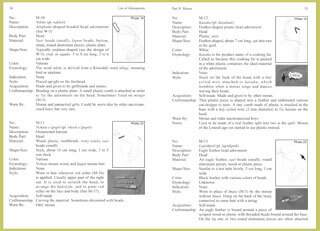 Based on those data, and using photographs and illustrations, the book describes 172 types of body adornments with their local names, etymology of the name, shape and size, color, material and manufacturing method, the way of acquisition, the user’s gender and age category, the body part the adornment is worn, wearing style, and their social and ritual significance. From the descriptions in the book, the readers will learn that necklaces or ear adornments being worn by a woman in a postcard are not only colorful and beautiful adornments but at the same time provide many kinds of information about the woman: e.g., whether she is single or married; whether she has a lover, whether she has already gone through circumcision; whether she has experienced childbirth or miscarriage, etc. Looking closer, we can discover, from a small shell or a cattle hair tied to her necklace, that she has had an experience of a breech birth or that a cow she is milking has not produced much milk recently. It is not so well known that the apparently “traditional” body adornments are in actuality undergoing rapid change. In recent years the design of the adornments has become more flamboyant, with many more beads being used. At times, young people bring back new designs and materials from the cities and tourist resorts where they work away from home. Body adornments may in fact be one of the most contemporary phenomena. The book also refers to how the materials, sizes and colors of the adornments have changed with time and to the tastes of the Samburu people. Whereas some adornments continue to evolve rapidly, those worn on the occasion of rituals of marriage and circumcision remain virtually unchanged. The color, design, by whom and when they are to be made, and when and how they should be worn are all regulated by detailed rules, which are strictly followed. The primary significance of the book is in its academic description, but it also offers good reading for becoming acquainted with the world of rich adornments of the pastoralists of East Africa. The book includes a foreword by Paul Spencer (Professor Emeritus of University of London), a leading social anthropologist. 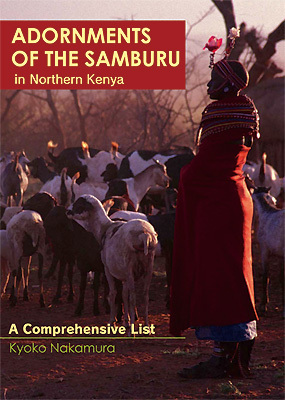 Among the Samburu, people are classified into groups based on their gender and age, with unique social roles given to each group. The book describes body adornments classified by each of those social categories. For each of the 172 types of adornments, 14 items are described in catalogue format, including: (1) serial number; (2) Samburu name; (3) description; (4) body part; (5) materials; (6) shape and size; (7) color; (8) etymology; (9) indication; (10) style; (11) acquisition; (12) craftsmanship; (13) social category of the wearer; and (14) notes. Each of the adornments is explained by text as well as illustrations and/or photographs. Illustrations are based on photographs of the adornment as it is worn, and the relevant adornment is indicated in bold lines. At the end of the book are 85 color plates that were used for making the illustrations.